Improvements will make access safer for pedestrians and cyclists. Every day, thousands of cyclists and pedestrians jockey for space on a narrow strip along the center of the Brooklyn Bridge. A ballet plays out as cyclists commuting to and from work dodge eager tourists looking for the perfect photo op, as the soft chime of bike bells blending with the din of car traffic below. At the Brooklyn terminus of the bridge, however, the already-chaotic scene devolves into a dangerous confluence of cars, bikes, and pedestrians as the path abruptly ends in the center of a busy intersection at Adams and Tillary streets. 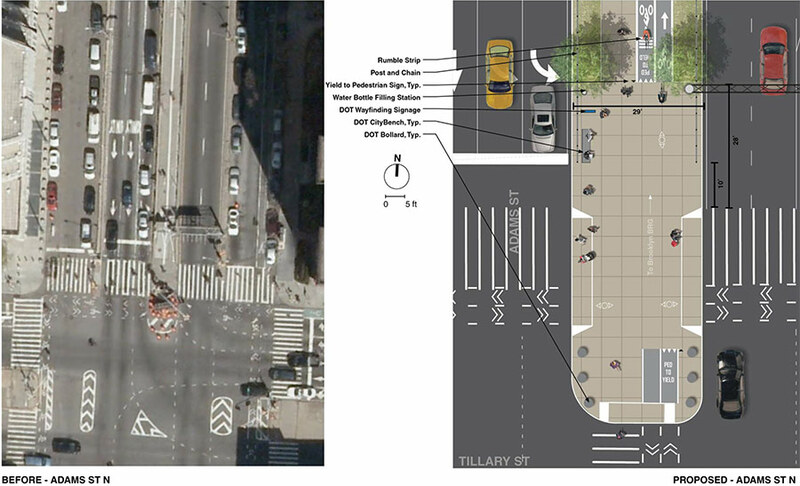 After five years of study, meetings, and schematic designs, however, accessing the Brooklyn Bridge will soon be improved under a plan to revamp the Brooklyn Bridge Gateway Area streetscape, encompassing Tillary Street between Cadman Plaza West and Prince Street and several blocks of Adams Street, with widened sidewalks, improved bike lanes, and increased landscaping. 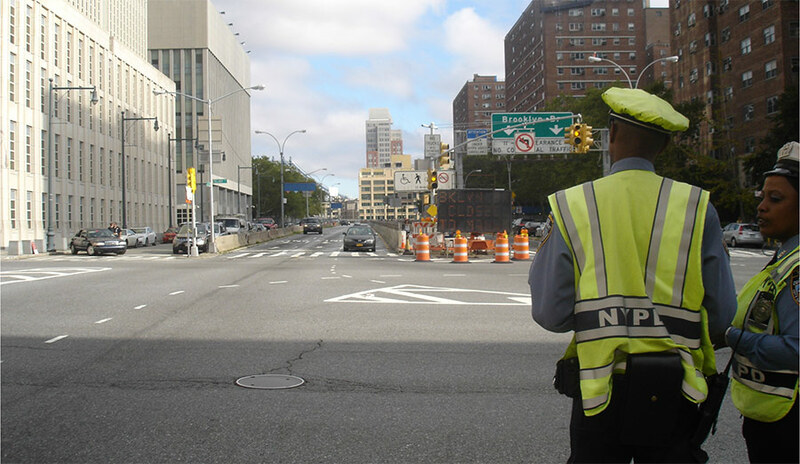 A joint effort of the New York City Department of Transportation (NYCDOT) and the Department of Design and Construction, the campaign to improve the bridge entrance began in 2009 with community workshops that identified project goals including improved safety and better aesthetics. At the intersection of Tillary and Adams streets, for example, the crash rate is nearly nine times the New York state average, with 117 crashes between 2008 and 2010. The dialogue resulted in a set of schematic plans presented in 2009 and 2011, but the proposal languished without federal funding until last December, when another update was presented to and unanimously approved by Brooklyn’s Community Board 2 Transportation Committee. 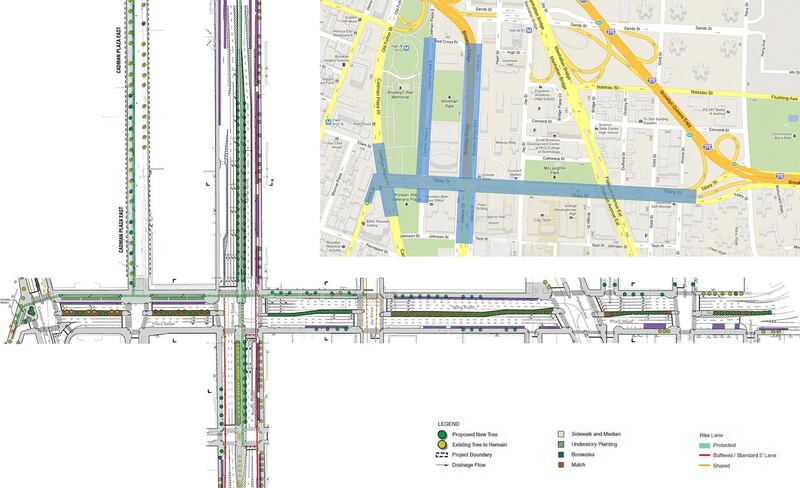 Existing and proposed changes to the bridge terminus at the intersection of Adams and Tillary streets. Last month, the full community board approved NYCDOT’s polished traffic safety and landscape plans showing the revamped Brooklyn Bridge Gateway Area. The first phase of the project reconstructs the entrance to the bridge at Adams and Tillary streets, softening the busy intersection with widened sidewalks, dedicated bike lanes, and more landscaping. 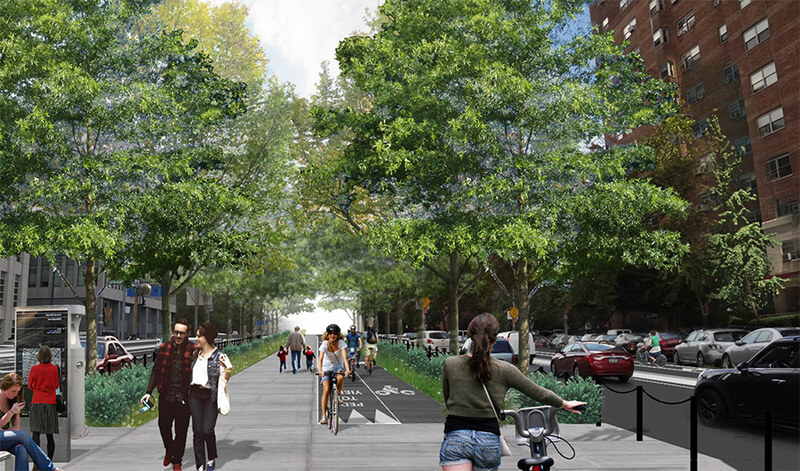 Pedestrian and cyclist access has been streamlined by converting Adams Street into a tree-lined boulevard with a 30-foot-wide median containing widened and separated paths for pedestrians and cyclists. The design includes place-making amenities such as new benches, wayfinding signage, bollards, and even a water bottle filling station. 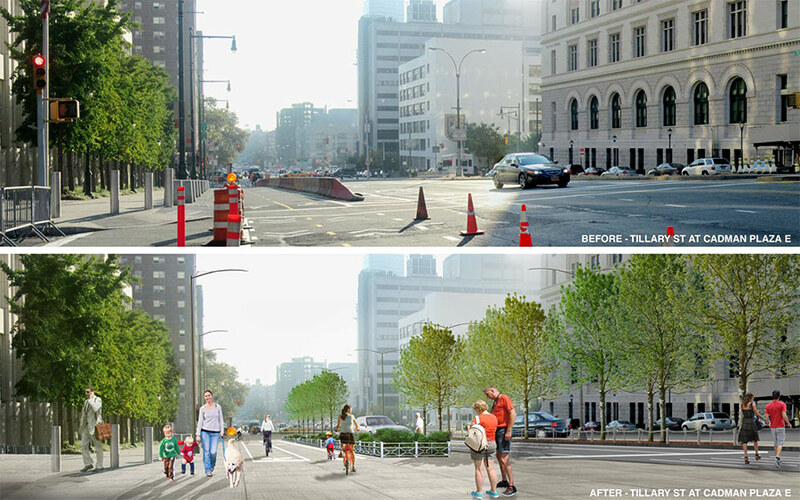 Widened sidewalks, improved bike lanes, and new landscaping will transform the public space along Tillary Street. An access road along Adams Street will be reconfigured to accommodate the wider median, including removing a row of parallel parking and adding a bike lane. A group of neighborhood residents have expressed concern about these changes, citing construction noise and pollution from passing cars. The group has asked the city to conduct an environmental review, but NYCDOT has said such a study is not required by law. Future phases along Tillary Street aim to increase safety and curb problems of motorists parking in bike lanes by replacing concrete jersey barriers along bike paths with extended sidewalks and new landscaping. The plan also streamlines bike access to Downtown Brooklyn. Throughout the target area, curb extensions at intersections—called neckdowns—and widened sidewalks will help slow car traffic, improve visibility, and reduce the length of street crossings. NYCDOT did not respond to requests for comment by press time. The city plans to begin construction on the first phase of the project along Adams Street by the end of the year. Construction is expected to last 18 months. Future phases are contingent on additional funding. Rios Clementi Hale's Sunset Triangle Plaza. A couple of weeks ago, Los Angeles Times architecture critic Christopher Hawthorne sat down with LA mayor Eric Garcetti at Occidental College’s Keck Theater to discuss the changing face of LA. The city, as Hawthorne mentioned (and as I have pointed out on numerous occasions), is undergoing a tectonic shift from a car-oriented, sprawling, and private city to a transit-oriented, dense, public-oriented one. So it seems fitting that LA has a mayor who, at least in his words, supports these changes and takes architecture and urban design seriously. In many ways the discussion was a chance for Garcetti to tout his accomplishments in the urban realm as both mayor and councilman, from the establishment of the Great Streets Initiative, meant to improve the pedestrian and bike experience on the city’s thoroughfares, to the installation of hundreds of new bicycle lanes, to the installation of numerous pocket parks. He also promised to start construction on a subway connection to LAX (and the extension of several other lines) before the end of his tenure, help re-fund the city’s affordable housing trust fund, complete the effort to recode our outdated zoning system, and he mentioned that he was tripling the size of the city’s Urban Design Office (albeit from one person to three). He spoke about his lobbying trip to the White House to fight for the transformation of the LA River, and mentioned that the Federal Government was now choosing between alternatives, not just weighing whether or not to do something. And you know what? A little bragging is ok. Granted many of these initiatives were started before Garcetti started office, and any of these accomplishments come from a large pool of people, not simply from his desk. But if somebody has a record in the urban realm to brag about, I want to hear about it. I want more people (particularly people outside of our fields) to understand that urban change can be a positive thing, not something to fear. Sure, not all change is good. But change in LA is inevitable, and if we know what we’re getting, and are willing to fight for the best result, then we can shape it to fit our needs. As much as we lament that LA’s fractured political system leaves our mayor without much power, having an ally in the urban realm is a gift that we can’t take for granted. The mayor can appoint the right people in relevant departments (planning, building, transportation, etc. ); he can issue executive orders; and he can rally people behind major initiatives. Just look what Mayor Bloomberg was able to achieve in New York City. Garcetti also wasn’t shy to attack the unsuccessful schemes that the city has undertaken in the past. He attacked the LAUSD’s recent wave of schools as “fortresses” that “don’t talk to the architecture of the city.” And he joked that widening the 405 Freeway was “analogous to finding a slightly bigger sponge to throw in the ocean. That being said he did not turn a critical eye on what he hasn’t accomplished, or what problems he could still address. Why, for instance, is our planning department reactive, not proactive? Why, despite all the talk, are our entitlement and permitting processes still so dreadfully inefficient? Why does our procurement process still favor the well-connected and well-financed? Why are we still allowing freeways to be widened, despite the mayor’s outrage about it? 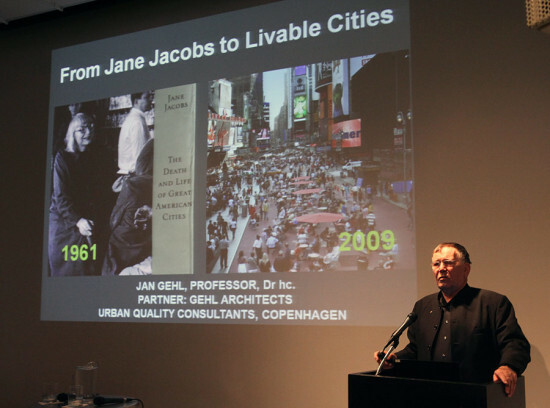 And why aren’t more architects part of (or leading) city commissions? Of course these are just a few, but the only part of the discussion that was missing was a critical look at where the mayor hasn’t been successful to this point. in such a public forum—is a victory for architects, planners, and any advocates for the urban environment. The more we can keep these topics on the radar the more this city, and others, will successfully adapt to fit a world that has changed dramatically and live up to its staggering potential. 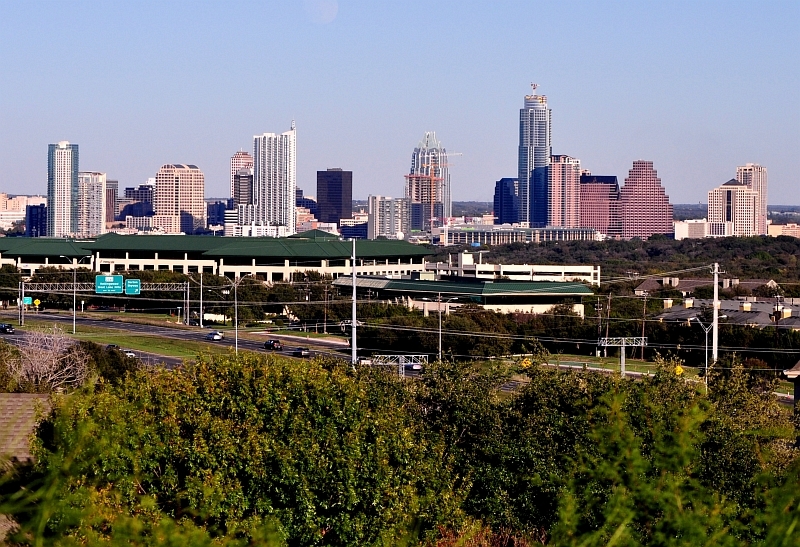 Since the construction of the twin freeway bridges that carry the MoPac expressway over Barton Creek in 1987, the Austin community has been clamoring for a bike and pedestrian bridge to accompany it. That outcry has now been answered. On February 11, The Texas Department of Transportation approved just such a crossing. The project will cost the state around $7.7 million and will take approximately thirty months to complete. 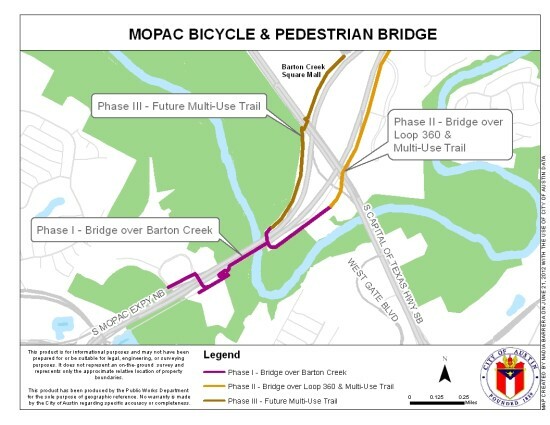 According to the Austin Public works department the construction will be handled in three phases: Phase I includes adding a bicycle/pedestrian bridge over Barton Creek at MoPac. 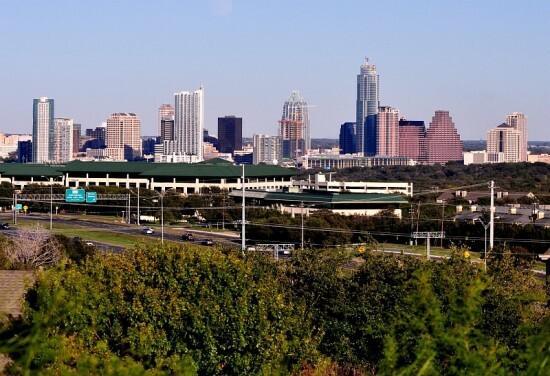 The south bound lanes of MoPac will also be re-striped to lessen traffic congestion and to improve bicycle and pedestrian connections to the Southwest Parkway, Loop 360, and other trails in the area, including the Violet Crown Trail and the Oak Hills Neighborhood Trail System. Phase II will add a bicycle/pedestrian bridge over Loop 360 at MoPac. Phase III entails the creation of a multi-use trail to accommodate bicycles and pedestrians on the west side of MoPac from Loop 360 to Tamarron Boulevard. After the plan is completed there will be approximately two miles of paved bicycle and pedestrian trails running along MoPac. While Austin is no stranger to trails throughout its many greenbelts, there are almost no such trails in the city where it is comfortable to ride a road bike. Construction these trails will improve the travel prospects for those wishing to commute via bicycle. Phases I and II have been funded since late June of 2012. On the February 11, financing was finally put in place for the last section of the plan. Some of the funding comes from the not-for-profit Friends of Barton Creek Bike Bridge, which was started by Solar Winds, Brandywine Realty Trust, and Commercial Texas in an effort to raise funds and awareness for the creation of the new bike path. 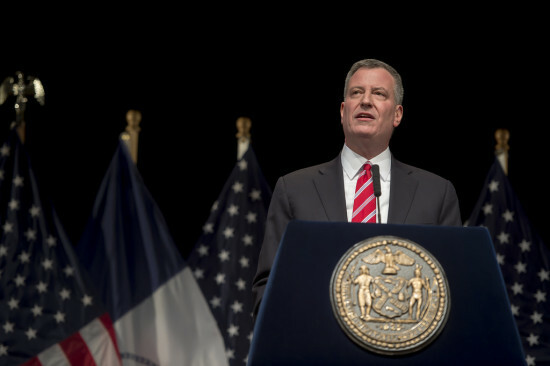 In his first State of the City address, Mayor Bill de Blasio promised to tackle the “inequality gap that fundamentally threatens [New York City’s] future.” At the LaGuardia Community College in Queens, the new mayor spoke of the “Tale of Two Cities” that has taken root in America’s largest city, and he promised to address it head-on. One of the main weapons in fighting inequality, explained de Blasio, will be creating more affordable housing. 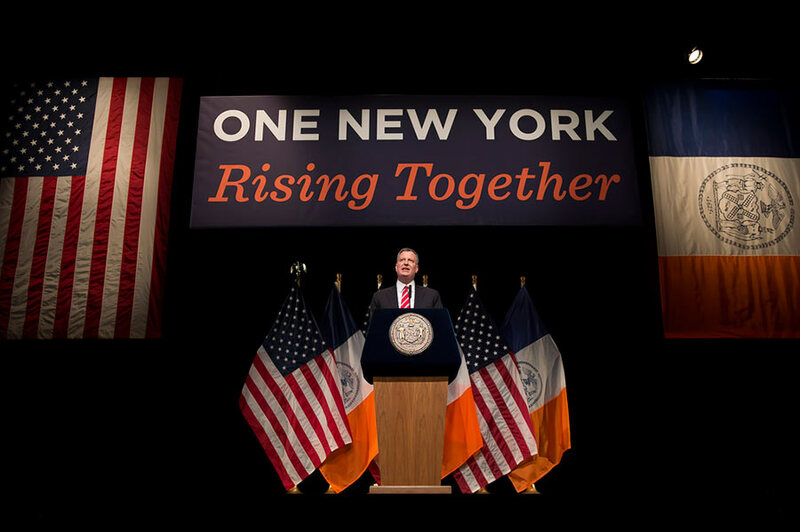 He spoke of “New Yorkers crushed by skyrocketing rents” and repeated his campaign pledge to “preserve or construct 200,000 units of affordable housing.” In a break with his mayoral predecessor, de Blasio said he won’t just incentivize developers to include affordable housing units, he’ll require it. “We want to work with the real estate industry to build. We must build more to achieve our vision,” said de Blasio. “But the people’s interests will be accounted for in every real estate deal made with the City.” While de Blasio offered no new details about how he plans to achieve this ambitious goal, he said his newly-appointed housing team will present a plan by May 1st. And following a string of pedestrian deaths, de Blasio pledged to “end the tragic and unacceptable rash of pedestrian deaths on our city streets,” through Vision Zero. The mayor, though, made no further mention of a transportation agenda—bike lanes, pedestrian plazas, or otherwise. On October 26, Illinois Governor Pat Quinn and Mayor Rahm Emanuel cut the ribbon opening a brand-new roadway through the former site of a massive U.S. Steel manufacturing plant. 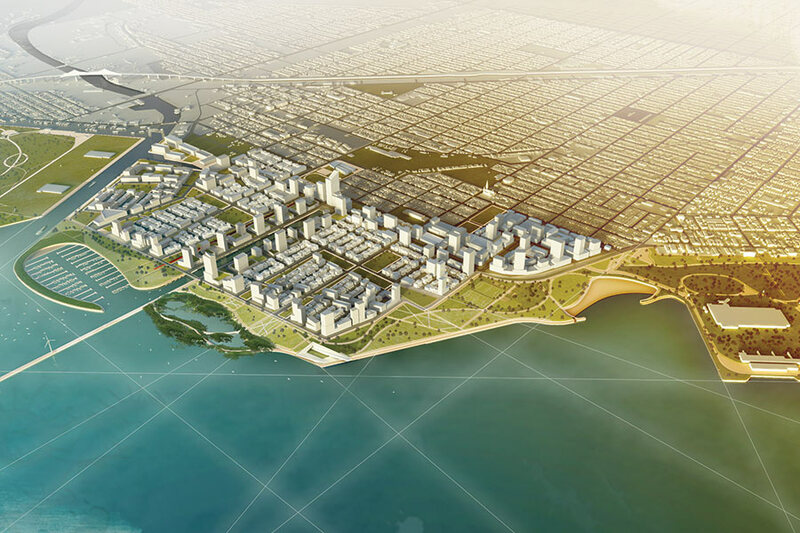 Over the next 40 years, McCaffery Interests is planning to build a massive, sustainably designed mixed-use development known as Lakeside on this 600-acre area in South Chicago. City and state transportation departments have been planning the South Lake Shore Drive extension to reroute through traffic on U.S. 41 around residential areas since before McCaffery and Skidmore, Owings & Merrill revealed the Lakeside master plan in 2004. 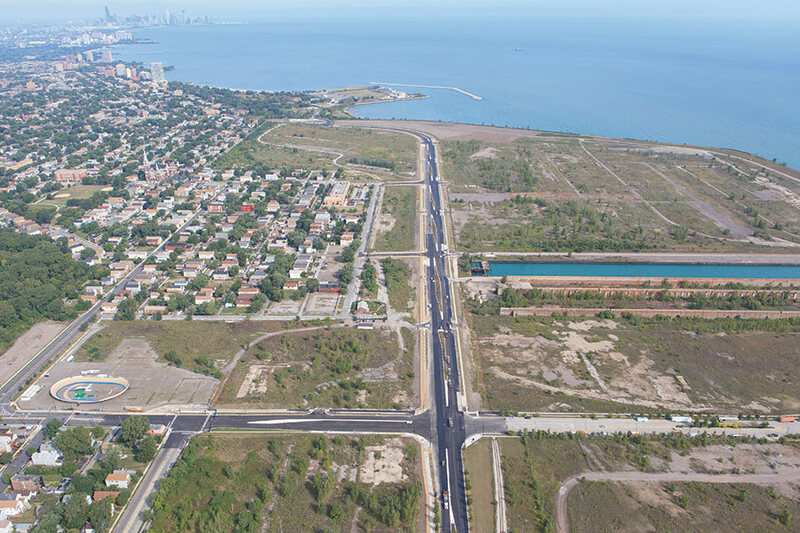 The $64 million, state and city-funded road now connects to 79th Street at Rainbow Beach Park in the north and crosses the Calumet River with Ewing Avenue in the south. It does more than provide a bypass of residential areas to the west. 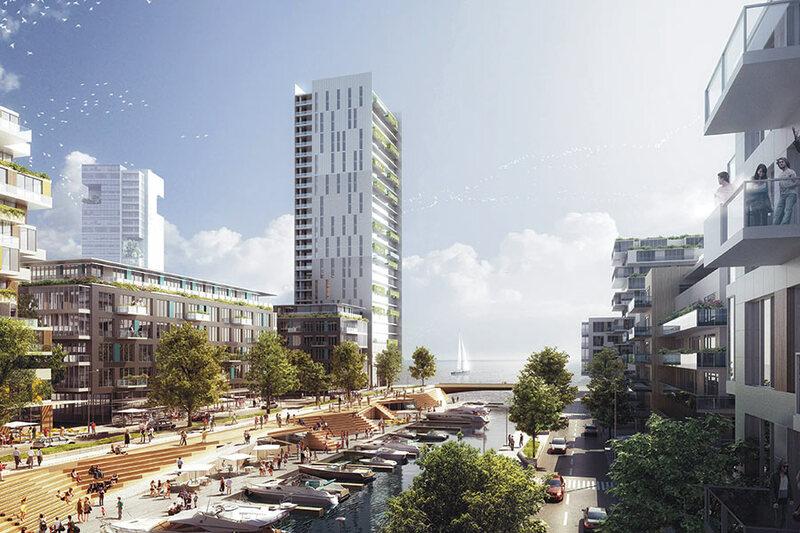 South Lake Shore Drive, which connects to Lake Shore Drive via South Shore Drive and Marquette, gives Lakeside the edge it needs to attract retailers to anchor its first phase, called the Market Common. During a tour in October, McCaffery Interests project manager Nasutsa Mabwa said that the road was delayed for three years. In 2010, press reports said construction would begin in 2012, but it wasn’t until Mayor Rahm Emanuel came into office in 2011 that the road’s construction got back on track. 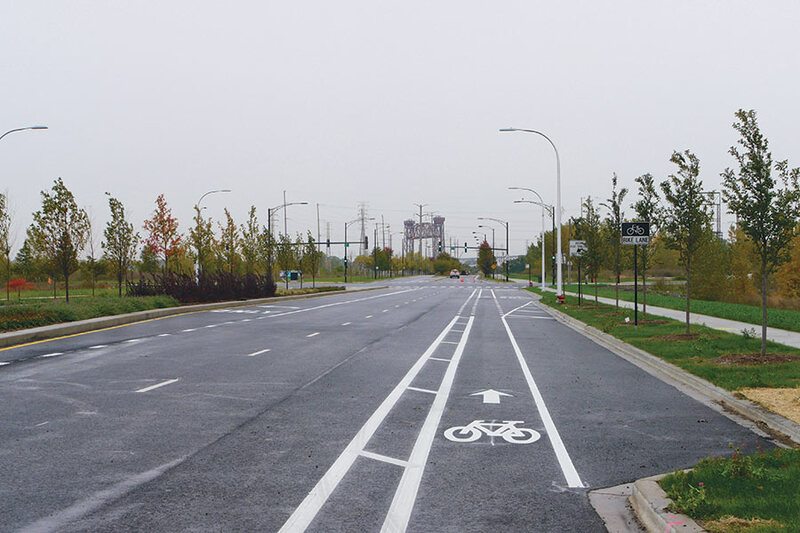 South Lake Shore Drive is 1.9 miles long and was built with some sustainable development features. For example, it offers parallel parking atop permeable pavement, is illuminated with LED street lights, and is planted with 600 new trees. 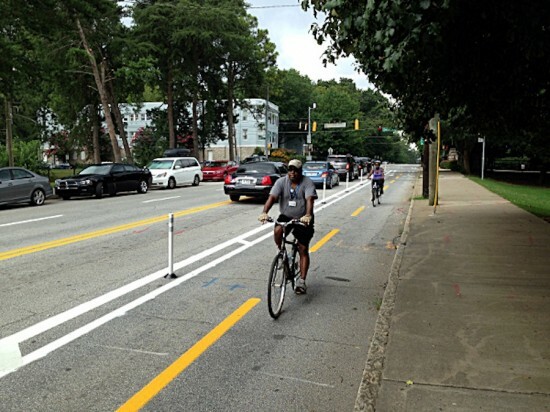 It also has wide bike lanes along half its length. The Lakeside website presents a transit vision of using rapid bus routes and light rail that cut down the travel time from the development to Midway airport and downtown. An electric commuter rail is less than half a mile away. Mabwa said that the images on the website are ideas. “We know we have some weak points and we know we have to bring the rail transit closer,” she said. The Chicago Transit Authority has the option to plan buss routes on South Lakes Shore Drive. All of its existing bus routes serve residential areas located a couple blocks west. 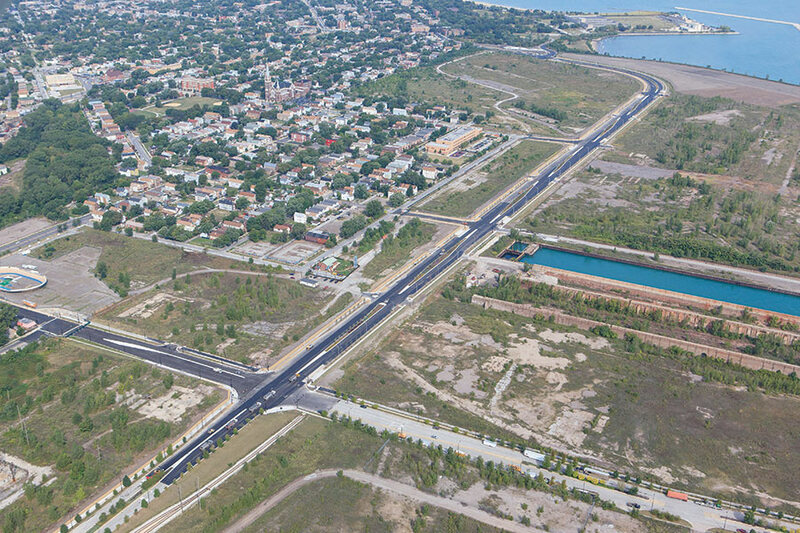 South Lake Shore Drive also opens Park 523 to the public for the first time. 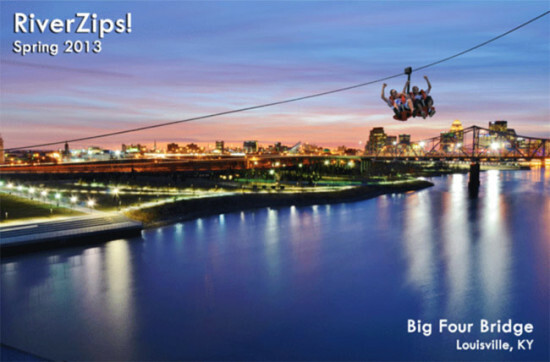 The park was built in 2008, just a year after Solo Cup sold some land to Lakeside Development, and five years after 87th Street was connected to meet it and provide access to a proposed Solo factory. The City of Santa Monica recently green-lighted construction on the $10.7 million Colorado Esplanade streetscape project, designed to improve public access to the Santa Monica Pier and provide pedestrian links from the soon-to-arrive Expo Light Rail line. Work will commence next year, and the light rail is scheduled to arrive by 2016. Designed by Peter Walker Partners, the landscape firm behind the National September 11 Memorial, the plan turns Colorado Boulevard into a westbound-only, multi-modal thoroughfare from the downtown Santa Monica station at Fourth Street all the way to Ocean Avenue, edging the coast. 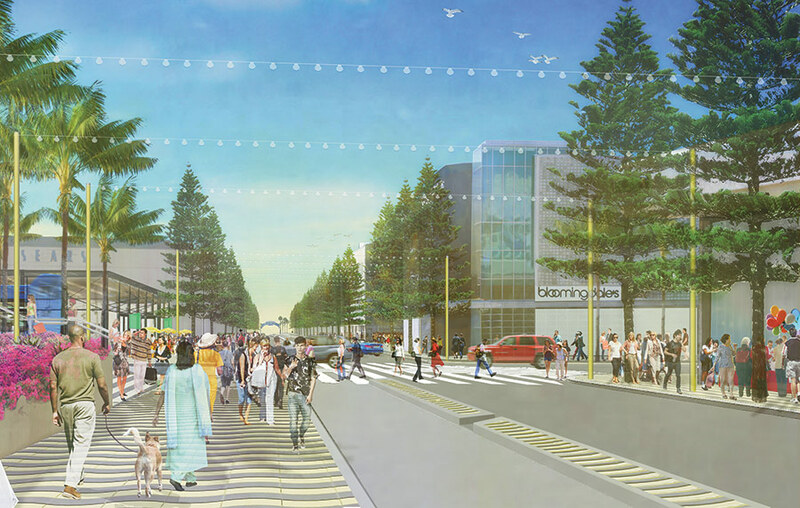 A new promenade will connect the light rail station to Ocean Avenue, the Pier, and the future Palisades Garden Walk. An expansive public amphitheater stairway, called the Gateway Triangle Garden, will lead to the Expo Line’s Fourth Street Station and create a dedicated public gathering zone, named the Downtown Expo Station Plaza. The City Council had earlier rejected a xeriscape design for this zone, noting that a more welcoming public space was desired. The plan also includes dedicated bike lanes in both directions and widens the south-side sidewalk to a generous 55 feet with decorative paving and seating. The lanes will eventually tie in to the regional network of bike paths and connect with Santa Monica’s Bike Center. Numerous trees will also be added in accordance with the city’s Urban Forest Master Plan. According to the Santa Monica Lookout, the city has secured $9.7 million in funding, including a $3.3 million Metro grant. When legislation shut down California redevelopment agencies last February, the city had to cut the promenade budget in half.